Driving in Tenerife. 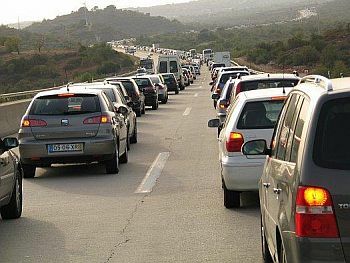 Even if you hail from a country whose traffic drives on the right, there are still a number of Spanish idiosyncracies to take into consideration when attempting to drive in Tenerife. If there is a forward pointing arrow on the road, you have right of way. If there is an inverted triangle, you must give way. When turning onto a dual carriageway, get over onto the right! If there are people waiting at a zebra crossing, you must stop to let them cross. It is a good idea, if going straight on at traffic lights, to get into the left-hand lane, as, if the lights are on red, there is often a flashing yellow light for right turns, meaning that anyone wanting to turn right may proceed with caution. If you’re in that lane, waiting to go straight on, you may hear a few horns being sounded behind you for blocking their way! There is one Tenerife driving idiosyncracy that you should be aware of. If you're behind a car and it suddenly indicates to turn left when there is no apparent left turn in the offing, it means that the driver is coming to a halt, to allow someone to cross or a car to pull out, for instance. In some other countries, a courteous gesture is rewarded by a quick flash of the headlights, as a thankyou. In Tenerife, there is the custom of a brief toot on the horn, to the same effect. There is also a quaint custom amongst native Tenerife drivers. If they see anyone they know walking down the street, they will just stop their cars in the middle of the road to have a chat with them, without a thought for other drivers. Just bear with them. It's their way. Here's a tip regarding leaving a motorway. Okay, you may think, I just take the slip road in much the same way as I would do in my home country, no problem. Indeed, that's the case, except if it happens to be "rush hour". Exit slip roads from Tenerife motorways quite often lead, quite quickly, to a busy roundabout, so a queue quickly develops. So what happens? The queue extends onto the motorway, doesn't it? And where is the only place for that queue to position itself? Along the hard shoulder, that's where. So, be ready for this. Otherwise, you may be gaily travelling along the inside lane, towards your turn-off, only to find that there's a long line of cars on the hard shoulder, stretching back behind you...and you have to try and cut in. You have to practically come to a halt in the inside lane, the motorway is only two lanes, you cause all manner of problems - and there could be a potential crash situation. So, just be warned: if the motorway is exceptionally busy, look up ahead for a possible queue on the hard shoulder when approaching your turn-off and be ready to pull onto the hard shoulder too and take your position at the back of it. Sometimes, the motorways in Tenerife have two separate slip roads leading onto them. Yes, it's true! The potential problem here is that one slip road will have to give way to the other. So, be aware, in this situation that your slip road may suddenly have the inverted triangle on it, meaning you should give way (see above). I know it's strange that you have to stop on a slip road to check if anything's coming on the other slip road, but that's the way it is. On the TF-1 motorway from the southern resorts to Santa Cruz, there is a short tunnel. The law for driving in Tenerife is that headlights must be turned on, even though you're only in this tunnel for about five seconds. This applies to all tunnels on the island and traffic police have been known to lie in wait at the other end to catch anyone who doesn't comply. Autopistas. These are the Spanish equivalents of motorways. Most of them on Tenerife are two lanes per carriageway. Approaching the capital city, Santa Cruz, the autopista becomes multi-lane and it can be a nightmare getting into the correct one. Autovias. This is the Spanish term for a dual carriageway that isn't a motorway. Vias Convencionales. The equivalent, in the UK, of "A" roads. These, by definition, have to have some sort of "hard shoulder" at least 1.5 metres wide, even if it's only a bit of rough ground. Vias Fuera de Poblado. Literally "roads out of town". The equivalent of the UK's "B" roads, but, as the name suggests, only if they're outside of a town. Vias Urbanas o travesías. This is what "B" roads are called if inside a town. Carretaras sin clasificación. Literally, "roads without classification", applying to rural lanes and dirt tracks. On Tenerife motorways, the upper limit is clearly signed at 120 km/hour. Were you aware that there's also a minimum limit of 60 km/hour, unless special circumstances, such as a queue, prevent this? Non-motorway dual carriages have a speed limit of 120 km/hour. The "A" roads are limited to 100 km/hour, the out-of-town "B" roads 90 km/hour and the in-town "B" roads, 50 km/hour. As in any town or city throughout the world, all speed limits are clearly signposted. Drink Driving - in line with most of Europe (except the UK), the limit is 50mg of alcohol to 100ml of blood (equivalent to less than a pint of beer or slightly more than a regular 150cc glass of wine). In past years, Tenerife police were a bit more relaxed about this, but, believe me, they're not now! Hefty on-the-spot fines can be issued for flouting the seat belt rule or not observing correctly the STOP sign. The police will also stop and fine you if you are seen overtaking where it is not allowed. 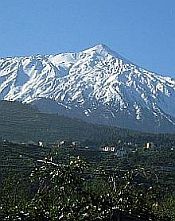 Companies in Tenerife operate in much the same way as anywhere else. If you've been sensible enough to take out fully comprehensive insurance, you'll still have to pay the excess, unless the policy states otherwise. After you've submitted a claim, your insurance company will send out an assessor (called aPerito), to inspect the vehicle's damage and report back to them. If the accident was the fault of the third party, you have a choice in the procedure that follows. You can either use your insurance - thus losing your no-claims bonus - or just wait for the other party's claim to go through his/her insurance. 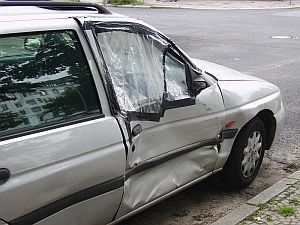 In this instance, it is a good idea to take photos at the scene of the accident, before the vehicles have been moved, showing the damage to each one. If you don't have a camera to hand, but have a mobile phone/cellphone, use the camera in that. If you chose this second option, you have to provide a quotation of the cost of the repair work required, so your insurance company can claim it back from the other party's insurance. Quite often, your policy will have had an option for "legal defense", in which case this will be dealt with by them. Be warned - waiting for third party claims to go through can be a long process! In choosing a garage to approach, look initially for a sign saying Chapa y Pintura (bodywork and painting). There is sometimes an additional logo of a hammer and paint-spray gun. To make sure that this is actually the garage that will be carrying out the repair (as some farm it out), you could ask to see their body and paint shop (although, good luck with your Spanish!). If you have chosen your garage, you then ask for an estimate. Beware garages that ask you to pay for an estimate. It should be free and, if they try this on, go elsewhere. Check if the garage actually works with your insurance company. If they don't, you'll have to pay for the repair out of your own pocket, then wait for the insurance company to reimburse you. This, as mentioned earlier, could take some time. Ask how long it's going to take. When signing the vehicle in, make sure you know exactly what the form says. Take a Spanish speaker with you, or get them to fully explain what you're signing. Bombard them with questions if necessary and, if the work seems to be taking an unrealistically long time, you are perfectly entitled to go in and ask to see your car, to check on progress. For someone who is a national of an EU country, but non-resident of Tenerife just visiting the island, they may carry on using their EU licence. If they have registered as resident, however, they are required to change it. Either they have their existing ones stamped, or get it exchanged for a Spanish one. For non-EU citizens, who have become residents, you need to obtain a Spanish driving licence the hard way - by taking the test! Yes, it's not an easy process and one that those having gone through the procedure speak of with dread. You are allowed up to a year to do it, during which you're allowed to drive on your old licence. Regarding the medical and eye test, you'll probably be certified fit if you're still breathing and can see where you're going without bumping into anything. The written exam is another matter, with far reaching questions on such diverse topics as auto mechanics, first aid and specifications of a variety of different vehicles. Fortunately, the test is multiple choice and can be taken in English. Rest assured, though, it's not easy. 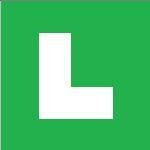 For the practical exam, you sit in the test car with your instructor beside you. The examiner sits in the back and the route makes no concession to your "learner" status. You'll be expected to negotiate busy city centres, winding country roads, hills and roundabouts. There'll also be the obligatory "parallel parking" manouevre. If you cave in to the pressure and fail, don't worry, you can take the test again and this also applies to the written exam. Apparently, there is a driving school operating out of the Torviscas area that offers lessons in English. I understand that the instructor is named Marion Torres and the offices occupy the premises of what used to be Autoescuela Carmelo. Marion conducts theory courses in English and a set of 30 lessons costs 300 euros.